View cart “Ansul Red Line 350 lb. Met-L-X Dry Chemical Wheeled Fire Extinguisher” has been added to your cart. Note: Monroe Extinguisher Company will calculate the most economical shipping method offline and verify the freight with customer before processing the order. Shipping costs will not be included on order confirmation, but will be added offline. RED LINE Wheeled Fire Extinguishers are manufactured to provide protection for hazardous areas where the potential exists for large fires. They can be strategically located to provide maximum protection for a wide variety of hazards, while taking up a minimum of space, and requiring only one trained person for operation. 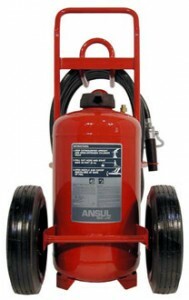 These extinguishers are available with three types of ANSUL dry chemical suppressing agents giving them the versatility to protect many types of fire hazards. The wheeled extinguisher is completely self-contained. An attached nitrogen cylinder is the only pressure source required to completely expel the fire suppressing agent. The pressure remaining in the tank after operation is sufficient for cleaning dry chemical from the discharge hose.